Bavaria's ruling family, the Wittelsbachs, called Munich home for more than four centuries. The Residenz in the middle of the city served as the political and cultural center of the Bavarian dukes and later kings from the 1500s up until 1918. Gilded, baroque, and over the top, the Residenz Museum is exactly what your kiddos picture when you mention the word palace. The Wittelsbachs are the longest continuously ruling family in European history, although the last Bavarian King was deposed in 1918. Their former residence, the Residenz Museum was opened to the public in 1920 and houses a vast collection of portraits, sculptures, and porcelains (the family had it's own in-house porcelain works). 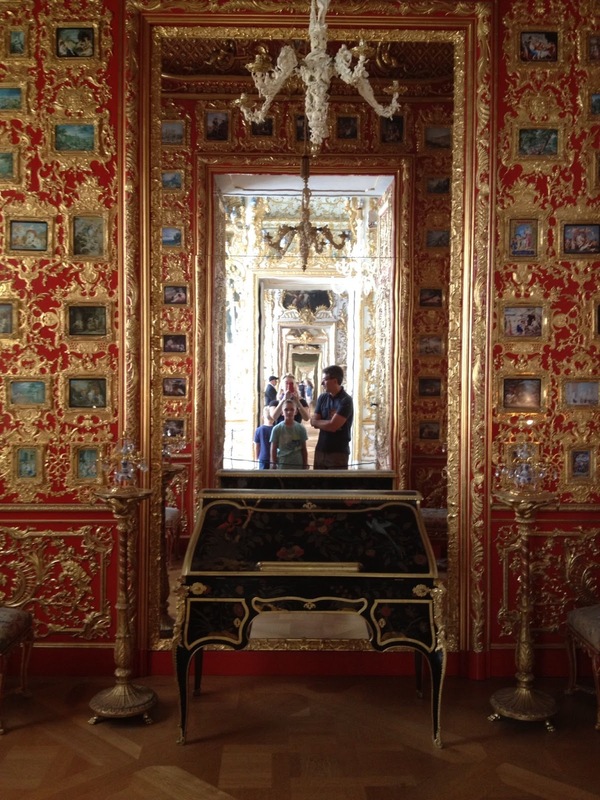 The nearby Treasury contains hundreds of years worth of Wittelsbach family gold, silver, jewels, and crowns. 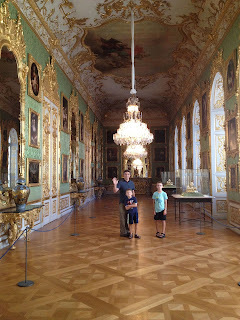 The 90 room Residenz is easy to tour around with the help of the free audio guide, about the size of a giant phone, and the boys loved following along at their own pace. I kept my Rick Steves Munich guide handy and used his room by room guide to the museum to fill in interesting details. 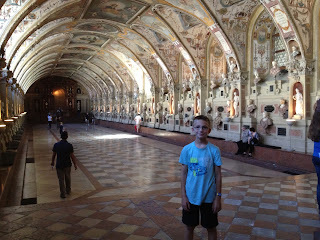 The Antiquarium is the oldest room in the Residenz and also the longest, it's still used today for elaborate banquets. More than 200 people can be seated in this room that stretches for more than 200 feet. The walls are lined with bucolic scenes of life around Bavaria in the 1500s and the small nooks house Roman busts, the Wittelsbach attempt to connect themselves to the ancient rulers of Rome. 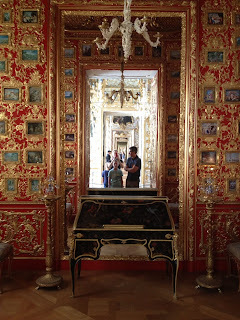 Most of the artwork along the walls of the palace involve ancient members of the Wittelsbach families, and we had lots of fun making up stories about the dour faced Dukes and bewigged Kings. This was the first palace the little C&Gs have ever toured and it definitely lived up to their grand expectations. Stay tuned for tomorrow when I'll show you the money. Diamonds, rubies, pearls, silver, gold, crowns, and all kinds of gorgeous treasures collected by Bavarian's royals for over 1,000 years. The small ten room Treasury is a wing off the main museum and was dazzling enough to keep the little C&Gs interested even after a few hours wandering the baroque palace. And of course C&G has the perfect place for wine and charcuterie within stumbling distance of all that opulence. The Residenz Museum is open daily from 9:00am to 6:00pm from April through October and 10:00am to 5:00pm November through March. 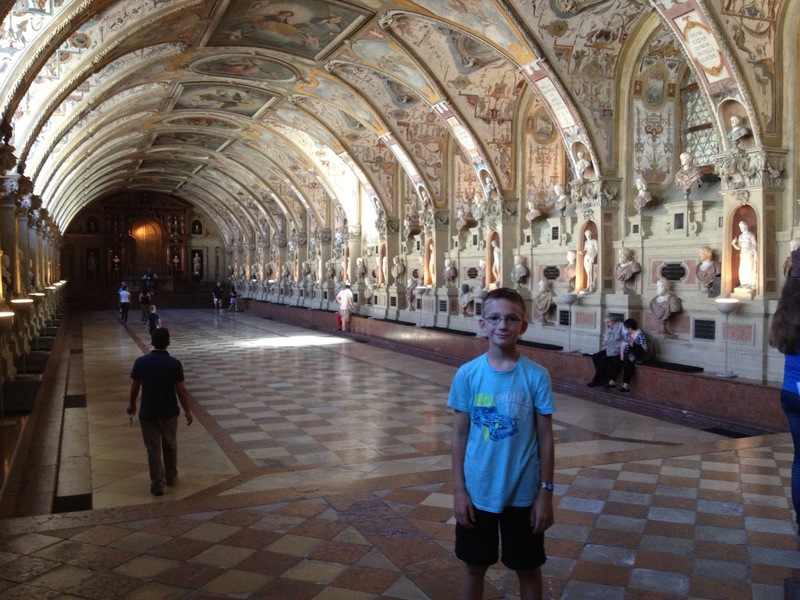 Admission for kids is free, and 11€ for adult admission to both the Residenz and the Treasury.